Cyclone Idai brought punishing rains and winds to Mozambique, Zimbabwe and Malawi, causing a humanitarian crisis for three million people. As the storm waters began to recede, people who had very little before the storm found that they now have even less. Nearly a week after southern Africa was hit by one the worst natural disasters in decades, it was all rescue workers could do to try to reach the flooding victims. Aid agencies said the huge storm that swept across Mozambique and into Malawi and Zimbabwe was the worst natural disaster in southern Africa in two decades. A United Nations official said workers had described â€œwater and water for miles and miles,â€� resembling an inland ocean where homes and towns had stood. Map and flag from Wikipedia. 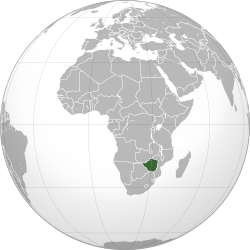 Zimbabwe is a small country that was a British colony named Rhodesia. Zimbabwe is an ancient country that now has an unstable economy. Articles in MJoTA focused on Zimbabwe, click here, click here and click here. A young Congolese refugee in Zimbabwe achieves his dream of going to university with a scholarship awarded by the US government. Abandoned as a child with no documents, Jabulani Sibanda has built an enviable life for himself and his family â€“ under the radar of the law. How someone can flee Zimbabwe, seek asylum in South Africa, become a migrant worker and wake up stateless one day with no country to his name. All 17-year-old Tsitsi wanted to do was go to school and earn a living â€“ but the men transporting her to a better life had other plans for her. A UNHCR-supported shelter offers assistance and protection to traumatized young women crossing into South Africa from Zimbabwe. High Commissioner for Refugees AntÃ³nio Guterres, representing the UN system, appeals to the international community to help meet the needs of tens of millions of the world's most vulnerable people. Stories about Zimbabwe published on MJoTA sites click here. The post Update on Bills and Government Gazettes appeared first on The Zimbabwean. In the villages, urban residential areas, mining towns and in the farms, they are turning up in droves at great personal expense and sacrifice during the unfolding MDC Congress to confirm the democratic ethos of this great peopleâ€™s movement by electing their leaders at the various levels of the party. The post The MDC 5th Congress: A tale of unfolding democracy appeared first on The Zimbabwean. The post The fight for Ntabazinduna mountain appeared first on The Zimbabwean. The post 7 things weâ€™ve learned about Earth since the last Earth Day appeared first on The Zimbabwean. The highly respected Paramount Chief of the Ndiweni people in Zimbabweâ€™s Matabeleland province, Chief Nhlanhla Felix Ndiweni, has spoken out strongly against the governmentâ€™s decision to evict popular Ntabazinduna white farmer and photographic safari operator, Brian (Buz) Davies and his wife Carol from their property. The post Eviction of white photographic safari operator and farmer angers local paramount chief appeared first on The Zimbabwean. Zimbabweâ€™s latest plan to compensate white commercial farmers who lost land during the fast track Land Reform Program 19 years ago has run into trouble. The post Zimbabweâ€™s plan to compensate white farmers is facing a backlash from party loyalists and the farmers appeared first on The Zimbabwean. Zimbabweâ€™s Chamber of Mines, which represents most of the mining companies active in the country, wants ownership restrictions on platinum group metals and diamond operations officially scrapped, the groupâ€™s president, Batirai Manhando, said. The post Zimbabwe mining firms want ownership restrictions scrapped appeared first on The Zimbabwean. Elements of corruptionâ€™ is a gross understatement but it was nevertheless a welcome breath of reality from President Mnangagwa in his ZBC television interview on the eve of Independence Day. The post Facing the truth â€“ Zimbabwe Vigil Diary appeared first on The Zimbabwean. I am in the Cape of Good Hope for two weeks, part holiday and part business. The weather has been variable â€“ three days of glorious early winter sun and clear blue skies and right now it is raining. The post A sense of History appeared first on The Zimbabwean. Zimbabwe Easter Open came to a close on the 21st of April 2019 at Causeway post Office Canteen. There was a lot of fighting chess from the ladies and gentlemen.Candidate MasterÂ Emarald Mushore won the Open Section with 7 points out of 8 games played. The post Mushore wins 2019 Easter open appeared first on The Zimbabwean.